Enjoy the best of beachfront living at Villa Anayara. In addition to a prime oceanfront location and sweeping sea vistas, the villa offers state of the art amenities, a glistening pool, sun-drenched outdoor spaces and an alfresco dining area with spectacular views. Containing five bedrooms, the villa is ideally kitted for travelling parties of 10. 10 guests are accommodated in five capacious bedrooms. All rooms feel inviting and expansive, with floor-to-ceiling glass doors, lofty ceilings and warm wooden finishes. Amenities common across all bedrooms include an en suite bathroom, Wi-Fi, sound system, safe, Apple iPad, Apple TV and Netflix. Guests at Villa Anayara enjoy the use of a sparkling pool, beachfront terrace with barbecue facilities and an alfresco dining area with views out to the ocean. The villa estate offers a private beach ideal for diving, boating, windsurfing and hosting events. 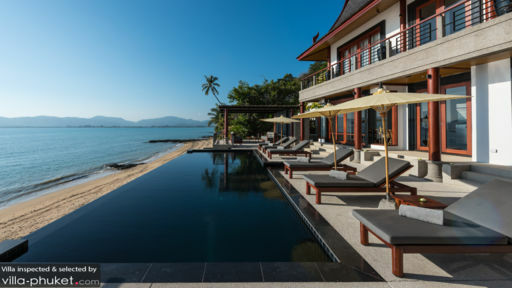 With uninterrupted views out to the Andaman Sea and Chalong Bay, the beach is ideal for an array of events and wedding ceremonies - from intimate family meals, to lavish banquets and fun-filled cocktail parties. An on-site team offers professional event planning services, so planning out your wedding will be a stress-free affair. 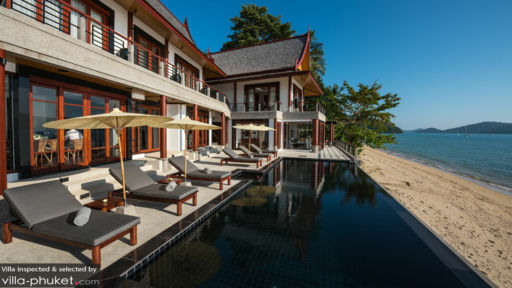 Villa Anayara combines traditional Thai architecture with contemporary design elements. 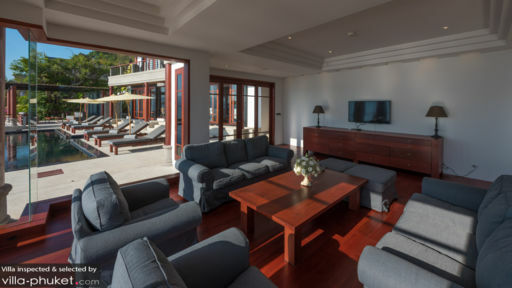 The living spaces are sunlit and spacious, with floor-to-ceiling glass doors that draw the eye out to the magnificent coastal landscape surrounding the villa. Highlights include the SieMatic kitchen with Thermador cooking appliances and Zubzero refrigerators, Bang & Olufsen and Lutron Integration System, formal dining area and a large outdoor sala. Villa Anayara is a full-service property. With four full-time staff are on-site, all your vacation needs will be well taken care of. Guests also enjoy private chef services, on-site spa treatments and a holistic programme that includes nutrition and detox consultations, as well as guided meditation and energy healing. Villa Anayara is located in the southern region of the island, close to Cape Panwa. The vibes here differ across the beaches - Cape Panwa is fairly remote, Nai Harn is uncrowded and tranquil while Kata oozes a lively, vibrant vibe. Water sports enthusiasts will appreciate the excellent snorkeling, diving and surfing available at the southern coasts. Hop into a car for a family day trip to attractions like Promthep Cape, Windmill Viewpoint, Kao Khad Viewpoint and Wat Chalong. Strolling along the charming streets of Old Phuket Town is a great way to take in the beautifully preserved Sino-Portuguese buildings, and explore the town’s array of cafes, restaurants and boutiques. To unwind, try out a spa ritual at ultra-luxe venues like Infinity Luxury Spa (at Kata Rocks) or Spa at Cape Panwa Hotel. Anayara Villa offers incredible spa treatments too, and you’ll have the option of enjoying an outdoor beach spa, or a treatment in the comfort and privacy of your villa. You’ll have no lack of dining options at this part of the island. Venues that come with our recommendations include Mom’s Tri Royale, Bistro Mon Ami, Top of the Reef, Ariake Restaurant and Rum Jungle Cafe. Or stay in for a private dining experience at your villa, where you’ll choose from a variety of menus, which include Thai, Western, vegetarian and kid-friendly fare.